It came as an unpleasant surprise to me that when air bags deploy there is so much smoke and chemical off-gassing, that this “safety” mechanism traps you in your car choking. I learned firsthand of this fact driving between Helena and Bozeman last fall on Interstate 90, where the speed limit is 75. I was driving the speed limit on my way home from the Western Environmental Law Center’s Helena office when two deer jumped out of the median into the left hand lane. Photo credit: CSKT, MDT, WTI. 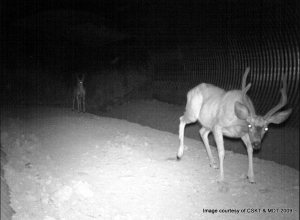 Two white tail deer using an underpass on Montana's US 93 (North). It was dusk, and given my line of work, I am usually hyper aware of watching for wildlife and slowing down to increase my reaction time in case the worst occurs. But, I was doing neither of these things – I mean, who hits wildlife on an interstate going 75 miles per hour? I did, and it has forever changed how I view the safety concerns of wildlife-vehicle collisions. Ironically, I have spent the last ten years of my life raising awareness about the safety and wildlife concerns of wildlife-vehicle collisions (known in the Road Ecology world as “WVCs”). But, other than a squirrel or two, I had never hit a deer, elk, moose, or other unfortunate creature. I prided myself on this fact, thinking it was the diligence with which I scanned the side of the road spotting any sign of movement. But, on that fateful afternoon, as the sun was setting and visibility was poor, the impact of the two deer on the front of my vehicle was practically instantaneous. I saw them, screamed, put my foot on the brake and before I even had a chance to set the brakes in motion –my car came to a screeching halt as the air bags deployed. Because I could not see, or breathe, I had no idea whether I was in a ditch on the side of the road, or in the median, or in the middle of the interstate. I opened my door and made a run for it. As it turned out, I was indeed wrecked in between both lanes at an angle. I ran to the side of the road, shaking and barely functioning. Luckily I-90 is a far cry from interstates like I-70 near Denver where cars are trailing you every second or so for miles. There were only a few cars behind me, one of which stopped to help me, and the other moved the deer off the road. When the tow truck driver arrived, his first comment was “Yep, this is where I pick up people all the time that hit wildlife – the river is right behind you.” I was horrified at the fact that this particular spot was a known wildlife crossing, and yet as a society we appear to be doing little about it. I handed my keys to the tow truck driver and told him to keep them. The car had been totaled. And my recently healed back pain started up again. I also made a mental note of the new data set I would share with my road ecology friends – tow truck drivers. While I hope that not many other people would have to go through what I experienced that night, unfortunately, it is not the case. The sheer number of people that have either hit an animal or have nearly hit one is astounding, evidenced by the number of stories I hear when I tell people that I help wildlife cross the road for a living. It is also evidenced by the reams of data that now exist on the growing trend of WVCs. Luckily, the field of “Road Ecology” has also been growing and collecting important information about the efficacy of wildlife crossing structures, in combination with wildlife fencing, in reducing collisions with wildlife. Wildlife-Vehicle Collisions are ubiquitous in Montana. Get behind the wheel and you should be watching out for wildlife. However, WVC “hotspots” often occur where wildlife migration corridors, as well as daily movement areas, intersect with roadways. A new coalition of organizations that advocates for innovative solutions to maintain habitat connectivity and provide safe passage for Montana’s people, fish, and wildlife, Montanans for Safe Wildlife Passage, is now becoming a great source of information and implementation in Montana. Visit us at http://www.montanans4wildlife.org/ where you can view motion-triggered camera photos that give you a sneak peak of Montana’s wildlife using underpasses and overpasses along US 93 and around the West. Collisions with wildlife are not only a safety hazard for people and wildlife, they can have serious impacts on wildlife populations, especially those that are in low numbers, such as lynx and wolverine. Montana is the last best place for wildlife, especially wide ranging carnivores. The field of Road Ecology has given us tried and true solutions to mitigating the effects of WVCs. If there was ever a state to boldy implement actions such as wildlife crossings, underpasses and overpasses, it is Montana. In fact, MDT staff and biologists are some of the best advocates for habitat connectivity. We now need a strong citizen base to support MDT to build more crossings and invest Montana’s transportation dollars toward WVC mitigation measures. Groups such as the Center for Large Landscape Conservation and the Western Environmental Law Center, that are both members of Montanans for Safe Wildlife Passage, were instrumental in ensuring that WVC provisions abounded in the recently enacted federal Transportation Bill (July 2012) giving states the ability to invest in wildlife crossings to keep Montana’s people and wildlife safe. You can take action by asking the Montana Department of Transportation (MDT) to utilize the provisions in MAP-21 to help protect Montana’s motorists and wildlife. You can also ask MDT to create a policy to use only wildlife friendly fencing on low volume roads to maintain habitat connectivity for Montana’s wildlife, especially in the most rural and wild places in this great state.